CFFO Comments on the Proposed Great Lakes Protection Act | Chatham-Kent Agriculture Development | We Grow For the World! 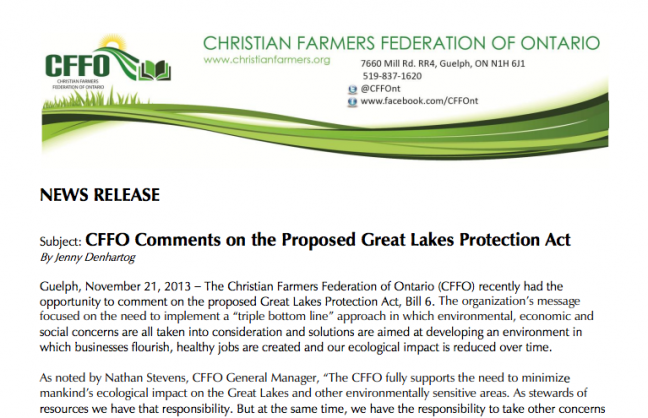 The Christian Farmers Federation of Ontario (CFFO) recently had the opportunity to comment on the proposed Great Lakes Protection Act, Bill 6. The organization’s message focused on the need to implement a “triple bottom line” approach in which environmental, economic and social concerns are all taken into consideration and solutions are aimed at developing an environment in which businesses flourish, healthy jobs are created and our ecological impact is reduced over time. The CFFO is pleased that both agriculture and industry are to be represented on the Great Lakes Council but is concerned that they are not specifically included in Section III, Ontario’s Great Lakes Strategy. It recommends that Section III includes of the same list of sectors that is currently listed for the Great Lakes Council. When it comes to the initiatives under the proposed Act, the CFFO’s main message is that the triple bottom line should always be the key basis on which solutions are developed and that failure to implement such an approach will make poor public policy. The initiatives under the Act are powerful tools and require an economic impact assessment to ensure that the chosen solution is balanced and will not only promote environmental sustainability but will also allow Ontario to thrive in today’s global economy.